Upon completion of book #3, I realized that this series is of a similar style to the Black Dagger Brotherhood series by J.R. Ward. 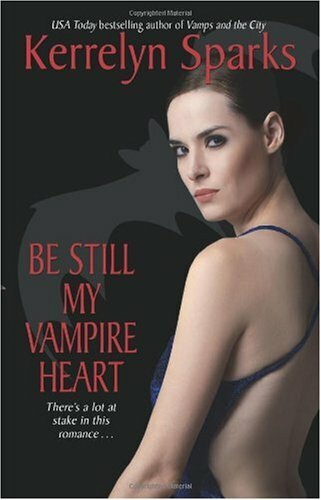 The series follows the lives of a group of vampires, and human characters, allowing the familiar characters to appear and interact with each other throughout each novel. However, each book follows a particular storyline geared towards a new specific couple (or potential couple). While I do enjoy this style, I find that when I have become attached to a particular character (or set of characters) I prefer to follow their specific adventures closely throughout future installments. My favorite characters in this series are Roman and Shanna, and due to their respective backgrounds, their future together could make for some very interesting tales. While we get a lot more of Roman and Shanna in this novel, (at least, more than we were afforded in book#2), our main focus is on Angus McKay (the owner of the Security company that Roman employs) and Emma Wallace (a recent member of the CIA’s anti-vampire “StakeOut” team). Angus (a 500+ year old vampire) was a noble Highlands Warrior from Scotland. While his current profession is owner of a very successful security company (that is contracted by the Queen herself), one of his main contracts is security for Romatech Industries (and Roman’s private dwellings). While in a meeting with his staff, he is informed that there is a “slayer” targeting the “Malcontents” (the evil vampires), and their leader Katya, believing that Roman’s entourage is responsible, is threatening to declare war on Roman and his group. Angus goes to the park where the vampire murders are occurring and realizes that the “vampire slayer” is a human woman (Emma). Due to her hate of vampires (her family was killed by them), she hunts them. While she has been fairly lucky, in her recent kills, Angus knows her luck will run out (a human cannot outfight a vampire) and feels a need to protect her. Over the span of a few days, Angus repeatedly tries to gain her trust (despite her numerous attempts at staking him). While Emma is deeply attracted to him (he is beautiful, gentle, and makes her laugh), and feels he would have been the perfect man (alive), she refuses to accept that she could fall in love with a vampire, and tries to resists him at every turn. While this novel focuses on the potential of love (and the hardships that come with such a situation), this installment moves quickly with the constant threat of danger (after all, both Emma and Angus are fighters, and they take the bad guys, head-on). She hesitated. “I suppose”. She reached into her tote bag and handed him a stake. If he got any funny ideas, she could kick it out of his hand in a second. “We saw you were awake. We thought you might be hungry.” He set the tray on the table. “Ye make a good servant,” Angus muttered. Alek glared at them both. “We are watching your every move. And very soon, we expect it to be quite entertaining.” Chuckling, he left the room. Burien followed him. The door slammed shut, causing all the silver to glimmer. The bolt slid home. Angus sighed. His flask was gone. His heart twisted. Poor Emma. Katya had come up with the perfect way to torture them both. No wonder she wanted to watch. Then her eyes met his and her spoon dropped with a clatter on the table. At last she was realizing the true nature of their imprisonment. While this one was, in my opinion, better than the 2nd book, the first story in the series remains my favorite. While I did connect with Angus and Emma, I found that the ending, while good, made me cringe slightly at how a Emma decided to handle a certain dilemma. Well I’m off to read the next one. Bring on Jean-Luc…hrmm…how will I picture him in my head? Any suggestions?